I unashamedly admit to owning a breadmaker! I have long since gotten over the feeling that it is not an authentic way to make bread. 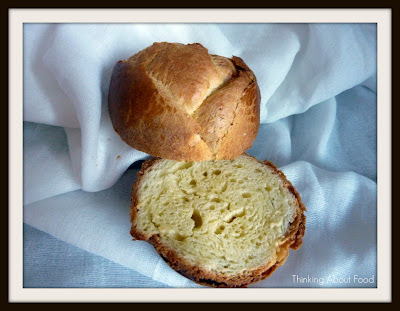 I very rarely bake bread in it, but I use it constantly to make dough which I shape and bake in the oven. Since I have been trying to keep to a strict budget pizza has featured regularly on the menu, because the kids love it and we can avoid the takeaway trap. This recipe makes enough dough for about 3 generous sized pizzas, we tend to stick to the basics with tomato on the base, then onion, ham, cheese and pineapple. If there are other bits and pieces in the fridge they will often end up included too. (Mushrooms, salami, feta, olives, pinenuts etc are all nice additions). 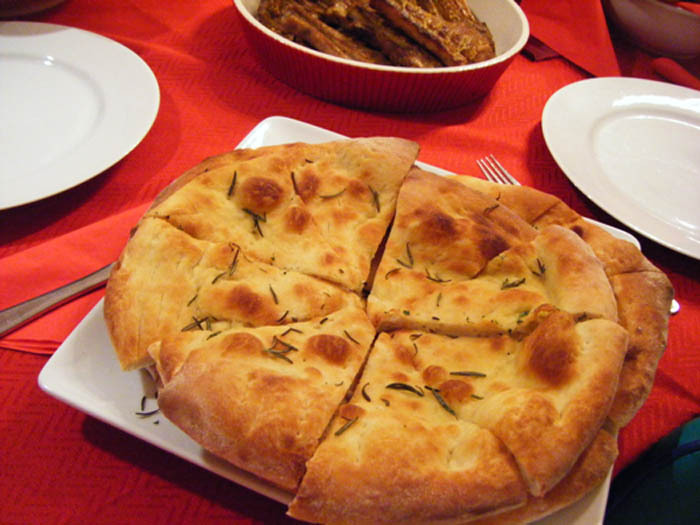 The recipe here I also use to make bread rolls or a focaccia, it is extremely versatile and I have found it very reliable. I will often make this on a Friday evening, the breadmaker has a 45 min pizza dough setting so I can do all the toppings up while the dough is sorting itself. And I can have a leisurely glass of wine while I wait!!!! 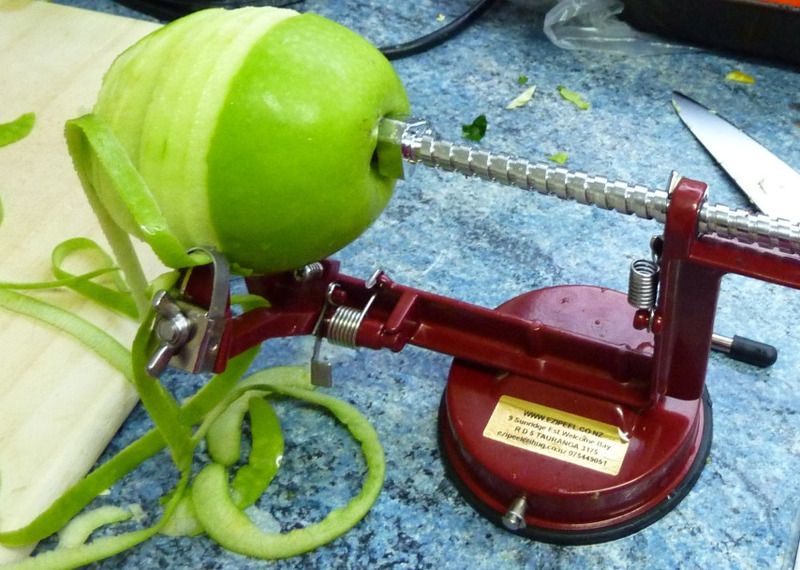 I tend to use apples alot more these days ever since investing in my trusty apple peeler. This little kitchen gadget has been a great find, my neighbour introduced me to it and I have since bought my own and several more as gifts. It is definitely NOT one of those use once and fling to the back of the cupboard gadgets. I use this regularly and it has been fantastic as a dessert substitute, my daughter will now happily eat an apple 'slinky' at the end of a meal! Preheat oven to 190C. 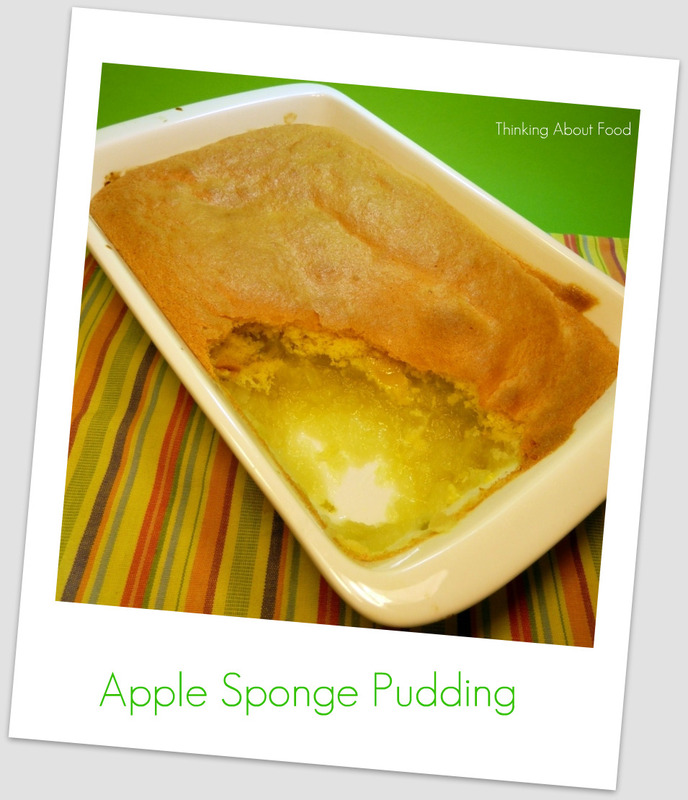 Place fruit in a shallow baking dish and place in oven while preparing sponge. Beat eggs and sugar until very thick and creamy. Lightly fold in flour and baking powder. Pour over hot fruit. Bake for 30 mins or until golden. Serve with cream or ice-cream. Serves 4-6. If you use your slow cooker alot I would definitely recommend owning both of their books. Turn slow cooker to high to preheat it. 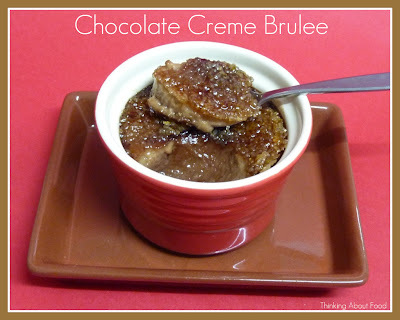 Warm a medium pot over a very low heat on a stove and add the chocolate. Once it starts to melt, add the evaporated milk, sugar coffee and vanilla extract. Keep the heat very low and whisk or stir until the chocolate is completely melted, then take off the heat. 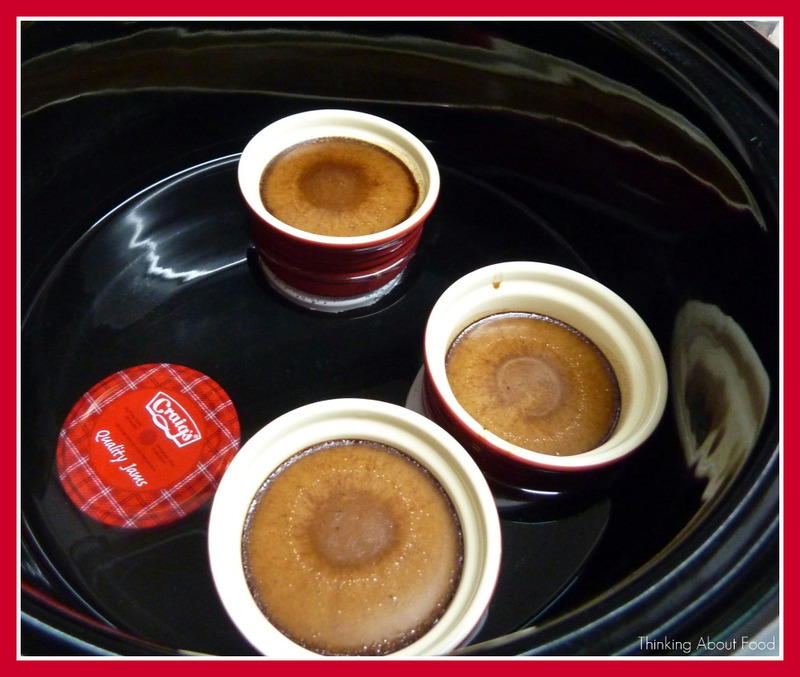 While the mixture cools down, prepare 4 1/2 cup ramekins by spraying with non stick spray. Break the eggs into the warm but not hot chocolate mixture and beat with a whisk until well blended, then pour the mixture through a sieve into a jug, and from the jug into the individual containers. Turn the slow cooker to low and carefully place the filled containers in it. Pour hot, almost boiling water into the cooker until it comes 3/4 of the way up the sides of the ramekins. (I placed mine on jam jar lids to diffuse the heat more). Cover and cook for about 1 hour or until the centres of the custards feel firm when jiggled slightly. Lift out the custards, allow to cool, then cover with cling film and refrigerate. To serve, loosen the edge of each with a thin sharp knife and invert onto a flat plate. I decided to brulee mine, so didn't refrigerate them, leaving them to get to room temperature before using my trusty gas torch to create a yummy crackly caramel top. Slow cookers are the bees knees when it comes to casseroles. They really do produce something quite fabulous without the expense of running your oven all day. I use to think casseroles were for the uninspired but have come to seriously appreciate the flavour and comfort that a well made casserole can offer. 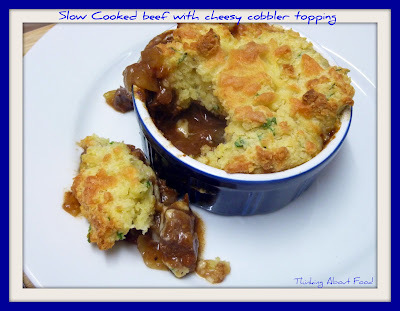 Of course there are so many variations, and my usual quandry is do I go with a beer base or red wine base- this time it is the beer base because it works so darned well with the cheesey cobbler topping that I often use to spin this out, serve it one night with mash and vege, the next night in individual dishes with the cobbler topping. This option is great for the freezer as you can freeze in individual portions and have a great meal in minutes when you don't feel like cooking. Or a snack for your teenage boy with the gargantuan appetite! This recipe comes from Simon and Alison Holst again, from the other slow cooker book I have of theirs.. The cobbler is a modified version of a Hugh Fearnley-Whittingstall recipe. Turn the slow cooker onto high and coat with non stick spray. Cut the meat into 2cm cubes, discarding fat but leaving the connective tissue, since it tenderises as it cooks. Place it in the slow cooker. Lightly brown the onions, garlic and bacon in the oil in a large frypan for 5 minutes. Meantime, put the remaining ingredients in with the meat. Add the pan contents when ready, stir everything together then put on the lid. Turn the heat down to low and cook for 6-8 hours. Taste before serving and add extra salt or brown sugar if necessary. 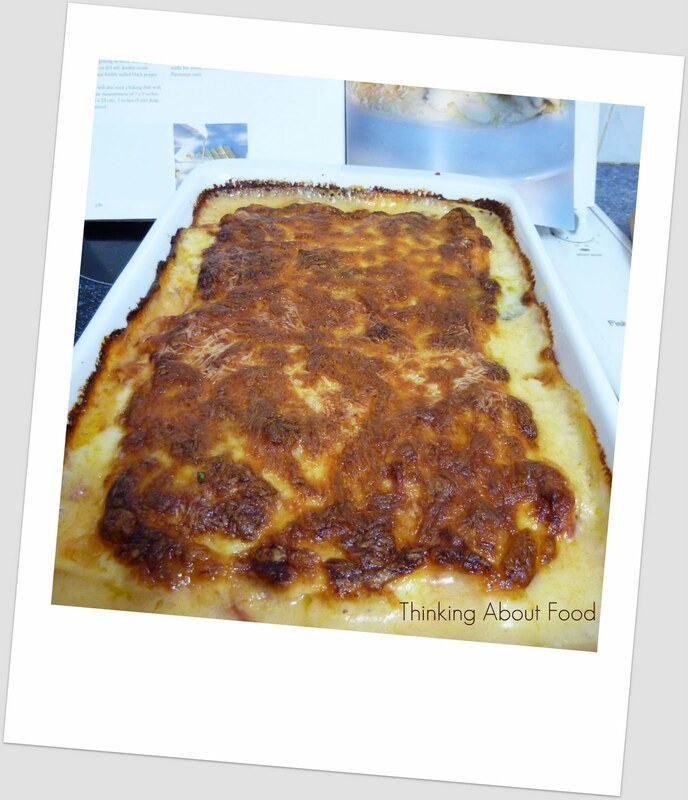 About 15 mins before serving, thicken the liquid with cornflour mixed to a thin paste with water and switch the heat to high. Sift the flour and salt, rub in the butter and stir in the cheese and chives. Whisk the eggs and milk, and stir into the flour mix - it should be fairly sloppy. 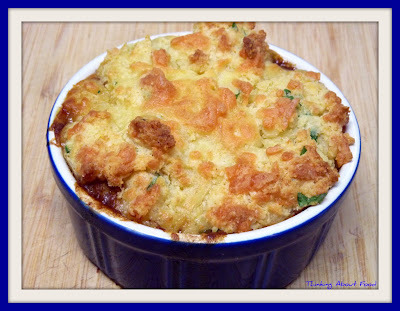 Drop spoonfuls of cobbler dough all over the top of the casserole (you can do this in one large dish or in individual ones, just adjust the cooking time to suit). Brush lightly with more milk and bake, uncovered, for 35 minutes until the cobbler is golden. Now that daylight savings has finished and the evenings are cooler I am seriously hankering for comfort food. I really love this turn of season time, where lighter, easier cooking makes way for hearty and more involved dishes. 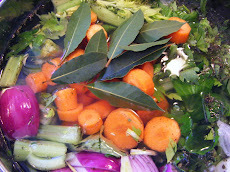 The slow cooker gets dusted off at this time of year and for me it is a staple of winter cooking. 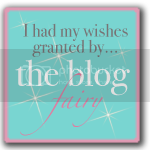 So much so that I am devoting these next 3 posts to it! I am a sucker for this kind of cooking, the ease in which things are produced, the flavour that results and the fact that often it is cheaper cuts of meat that are best used in this way make me quite enamoured with this one piece of kitchen equipment! I think it is the busy cooks best friend and there is nothing nicer than returning home to the great smell of dinner cooking and the prospect that not a lot needs doing to get dinner on the table. This meal is one of my favourites. And who doesn't like pork belly???? Even my son who is near phobic about animal fat happily eats this without disecting the hell out of it. Because of the slow cooking process the fat almost blends into the meat making this a delicious melt in the mouth dish. It comes from that trusted pair Simon and Alison Holst and I really recommend it as a bible if you use your slow cooker alot. They have put out two books on slow cooking and I have them both and over winter they get a great deal of use. 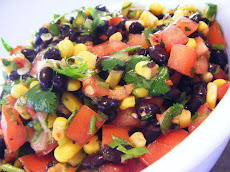 I serve this with stir fried veges and some rice with fresh chopped coriander stirred through. Turn slow cooker on to high. Score rind of pork about 5mm apart. Place meat, skin side up on a folded piece of foil and put into slow cooker. 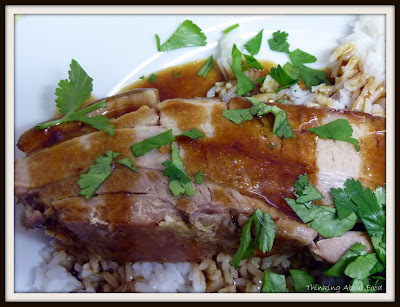 Add the remaining ingredients, then turn pork several times to ensure it is coated with the flavourings. Cover and cook for 4-5 hours, turning meat over once or twice during cooking. To serve, lift meat out and place skin side up on a board and cut into slices. Pour spoonfuls of cooking liquid over each serving. These are the most ridiculously easy dessert possible and a great store cupboard favourite of mine. 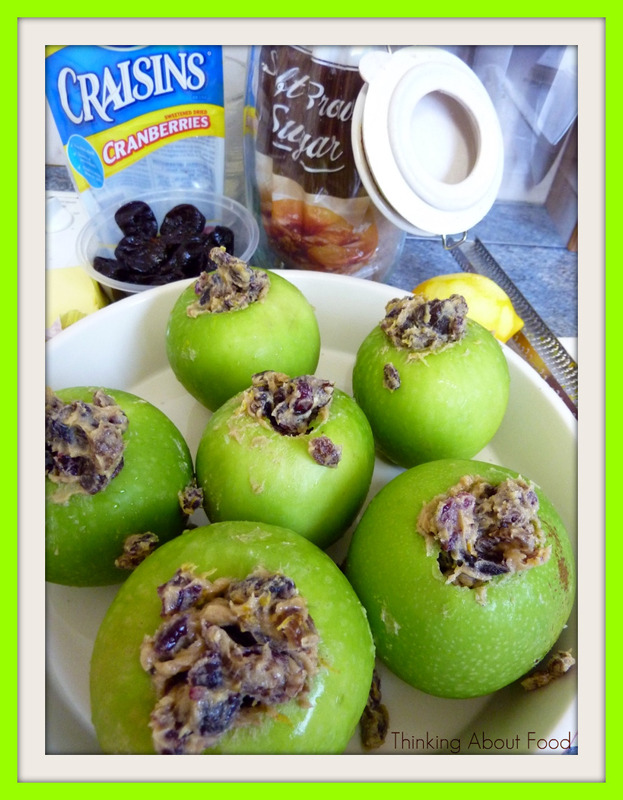 There are all manner of variations one can make - any sort of dried fruit stuffed into them can be substituted and changing things up keeps it interesting. They are a great dessert to make when the oven is already on and require very little preparation, the oven does all the work. My favourite at the moment is dried cranberries which when combined with some sultanas and some orange zest make this seriously yummy. You can also experiment with different sugars, using a dark muscovado sugar with some dates gives a rich dark caramel flavour that works extremely well. You can add to the whole experience by serving with ice cream or a proper vanilla custard, or if you are more virtuous perhaps some greek yoghurt. You can make this as decadent or austere as you like, either way it is a tasty and easy (and cheap) dessert. Preheat oven to 180 C. Soften butter and mix with brown sugar. Add dried fruit, zest and cinnamon, mix to combine. Core apples and fill cavity with fruit mixture. Place apples in oven proof dish and bake for 30-40 mins until soft. Over the course of Glen's illnes I found myself the recipient of much unexpected kindness. 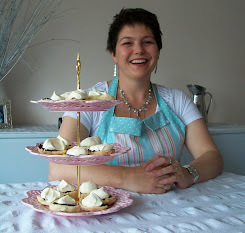 A good deal of that kindness came from one of the foodie forums I belong to- Violet's Pantry. A like minded group of people, all serious about cooking, it has transformed from our shared love of food to so much more. The shared interest has extended beyond food and it has become a community which shares celebrations and commiserations, which marks births, marriages and deaths as well as the daily minutiae of life. I have been very grateful for the support I have received from what has become a close knit group. Much of the kindness has been in the form of moral support, but equally I have found countless parcels coming my way, 'cheer' packages which indeed have helped to raise a smile on days when I have needed it. Alot of them seem to follow the theme of baking, these people know me well! 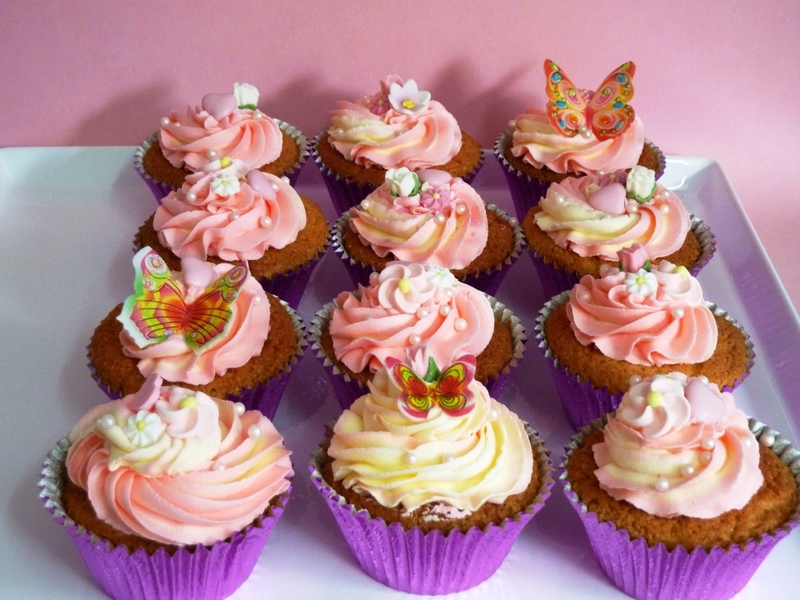 After all, who wouldn't feel a little better after flicking through a book of beautifully baked and decorated goodies? This book certainly lifted my mood. 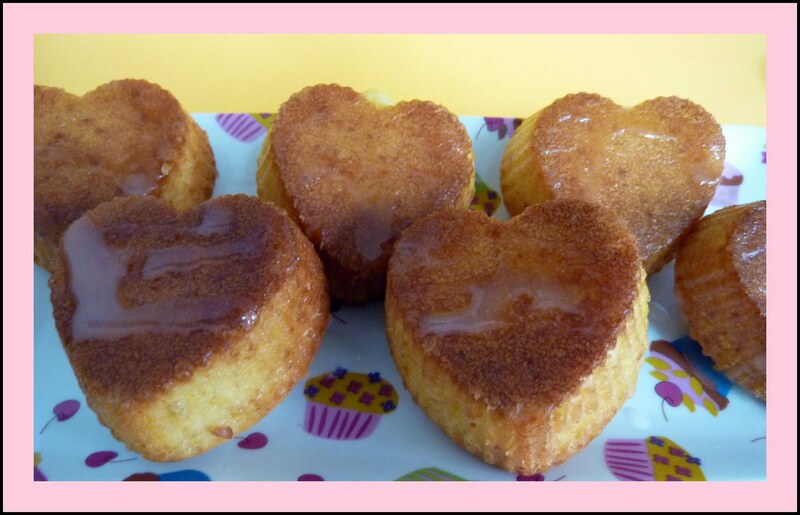 It is called Love Bakery - Cupcakes from the heart. 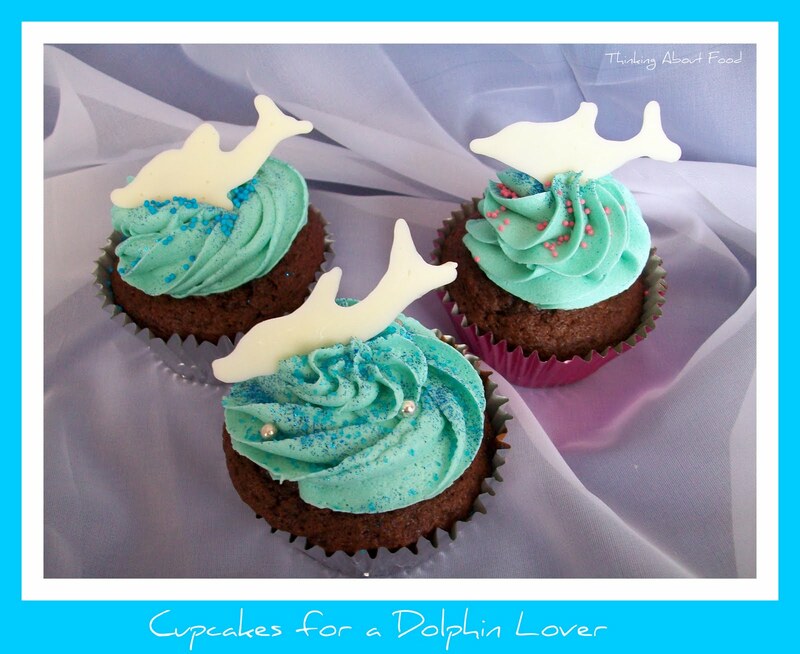 It is so beautifully put together and showcases everything that I love about cupcakes. Who would have thought you could have so many variations on one small cake- but I am still entranced by the possibilities of flavours and decorations for cupcakes which is why I am still making them. They are still being gratefully received by those who eat them too! These cupcakes were for a good friend of mine's birthday. This recipe is somewhat standard for a cupcake, differs though from the Hummingbird version in that it is not as sweet, but I think the Hummingbird recipe probably keeps better. 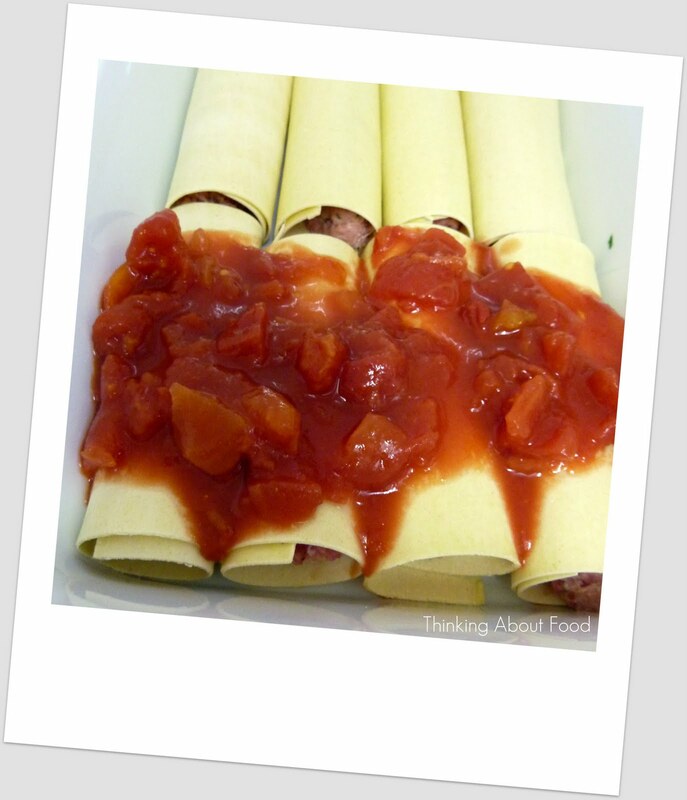 The nifty thing about this recipe is the method for filling them, using an apple corer- and then there are all the variations you could make for filling them, in this case it is with strawberry jam, but of course you are limited just by your imagination here. 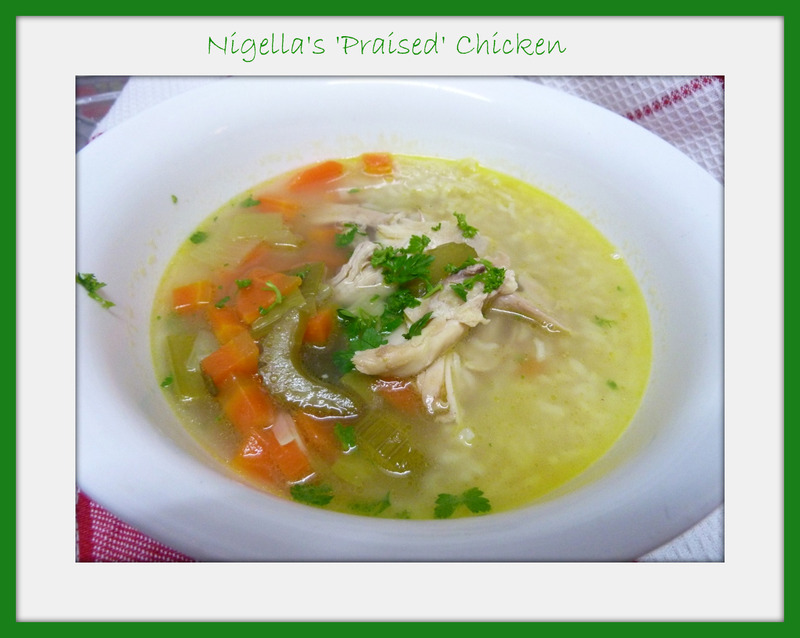 This was a straightforward and delicious recipe that I will be trying again. 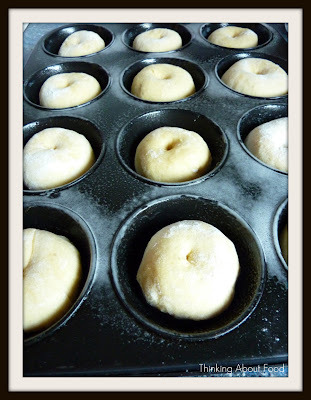 Preheat oven to 180 C. Line a 12 hole muffin tin with cupcake cases. Add the butter, caster sugar and vanilla extract to an electric mixer and beat for 7 minutes or until light and fluffy. Add the eggs, one by one and mix for 2 minutes. Mix the flour and baking powder together in a separate bowl, then add to the mixer until incorporated. Add the milk and mix for a further minute. Use an icecream scoop to divide the mixture evenly between the cases. 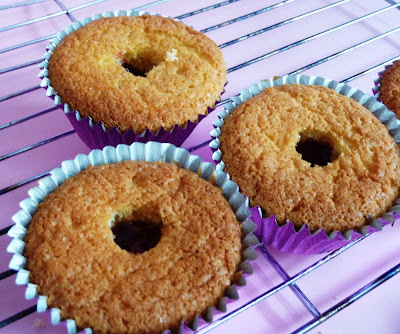 Remove baked cupcakes from the oven and immediately transfer to wire rack, leave to cool. Cream the butter in the mixer for 2 minutes until light and fluffy. Add the icing sugar and milk and mix for a further 2 minutes until well blended. (if you want it even lighter add a little more milk). Divide the frosting in half and spoon into 2 separate bowls. Add the vanilla extract to one bowl and mix well. Add the strawberry extract, if using, to the other bowl. 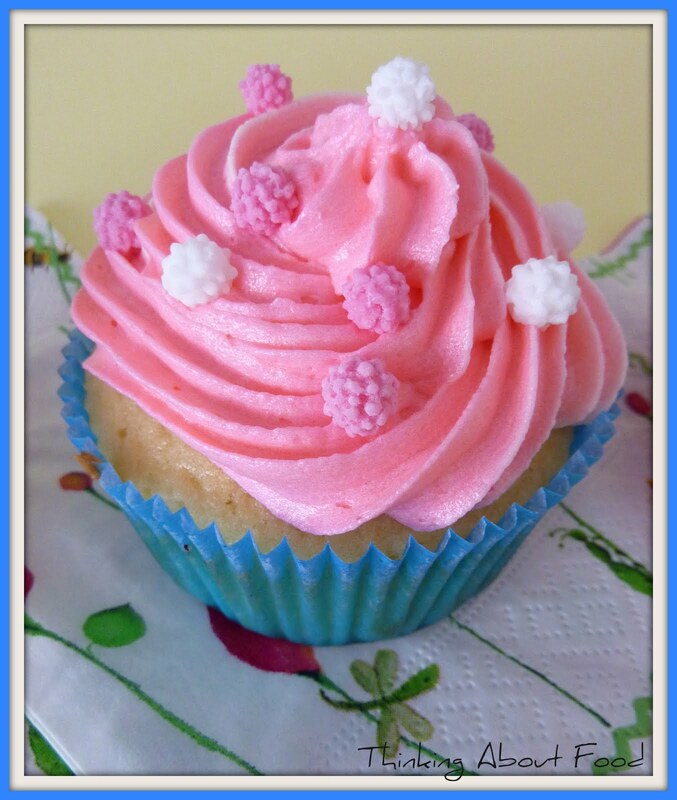 Dip the tip of a small knife into the red food colouring, add to the strawberry frosting and mix well. Pipe swirls of frosting over top of cupcakes. 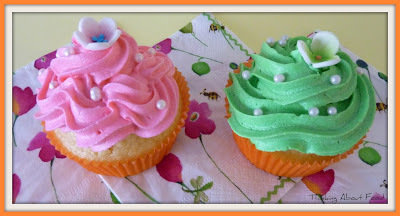 Decorate with flowers, sprinkles and maybe some edible glitter. If you are ever in need of something reasonably quick and easy but a little bit special for lunch then this recipe fits the bill. I probably think it is a bit special because it requires making your own pastry, which is not so onerous when you have a food processor. 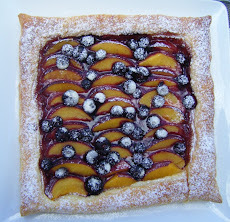 Home made pastry is always so much nicer than store bought, and to be fair is definitely worth the effort. This is perfect served up with a salad and some nice fruity chutney or relish. The recipe comes Delia Smith's How to Cook series, a book that is full of how to advice and recipes for the beginner cook but is also more than useful for the accomplished cook. It has really useful stuff in it like how to cook eggs, and I find myself still referring to it for exact instructions on boiling eggs!!!! I have found stacks of recipes in this book that have become firm favourites and are more importantly family favourites so get made again and again. The only problem with Delia's recipes is that they are very long, she likes to give very exact instructions, which is fine and very reassuring for the beginner cook, but when typing out for a blog is a bit of a pain. So I have cut and paste this recipe from her website Deliaonline and included it here- apologies in advance for the length of it!!!!! First sift the flour with the pinch of salt into a large bowl, holding the sieve up high to give it a good airing. Then add the lard and butter and, using only your fingertips, lightly rub the fat into the flour, again lifting the mixture up high all the time. When everything is crumbly, coarsely grate the goats' cheese in and then sprinkle in some cold water – about 1 tablespoon. Start to mix the pastry with a knife and then finish off with your hands, adding a few more drops of water, till you have a smooth dough that will leave the bowl clean. Then pop the pastry into a polythene bag and let it rest in the refrigerator for 30 minutes. Meanwhile, pre-heat the oven to gas mark 5, 375°F (190°C) and pop the baking sheet in to pre-heat on the centre shelf. Now prepare the leeks. First take the tough green ends off and throw them out, then make a vertical split about halfway down the centre of each one and clean them by running them under the cold-water tap while you fan out the layers – this will rid them of any hidden dust and grit. Then slice them in half lengthways and chop into ½ inch (1 cm) slices. Next, in a medium-sized frying pan, melt the butter over a gentle heat and add the leeks and some salt. Give it all a good stir and let them cook gently, without a lid, for 10-15 minutes or until the juice runs out of them. Then you need to transfer them to a sieve set over a bowl to drain off the excess juice. Place a saucer with a weight on top of them to press out every last drop. By this time the pastry will have rested, so remove it from the fridge and roll it out into a circle on a lightly floured surface. As you roll, give it quarter turns to keep the round shape and roll it as thinly as possible. Now transfer it, rolling it over the pin, to the tin. Press it lightly and firmly over the base and sides of the tin, easing any overlapping pastry back down to the sides, as it is important not to stretch it. Now trim the edges and press the pastry up about ¼ inch (5 mm) above the rim of the tin all round, then prick the base all over with a fork. After that, paint some of the beaten egg for the filling over the base and sides. Now place the tin on the baking sheet and bake for 20-25 minutes or until the pastry is crisp and golden. Check halfway through the cooking time to make sure that the pastry isn't rising up in the centre. If it is, just prick it a couple of times and press it back down with your hands.While the pastry case is pre-baking, crumble the goats' cheese with your hands, then gently combine it with the leeks in the sieve. Now, in a jug, mix the beaten eggs with the crème fraîche or double cream, seasoning with just a little salt (there is some already in the leeks) and a good grinding of freshly milled black pepper. 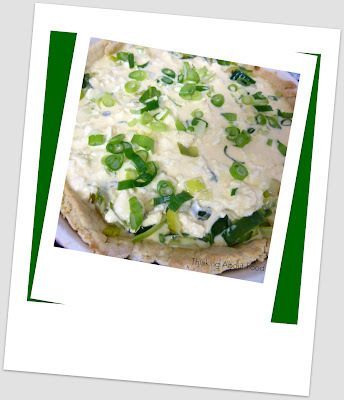 As soon as the pastry case is ready, remove it from the oven, arrange the leeks and cheese all over the base and then sprinkle the spring onions over the top. Now gradually pour half the cream and egg mixture in to join them, then put the tart back on the baking sheet with the oven shelf half pulled out, then slowly pour in the rest of the mixture. Gently slide the shelf back in and bake the tart for 30-35 minutes, until it's firm in the centre and the surface has turned a lovely golden brown. Next, remove it from the oven and allow it to settle for 10 minutes before serving. 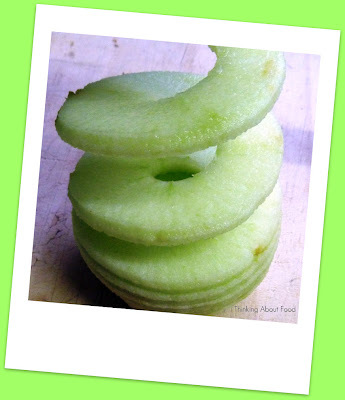 This 10 minutes is important as it will be much easier to cut into portions. 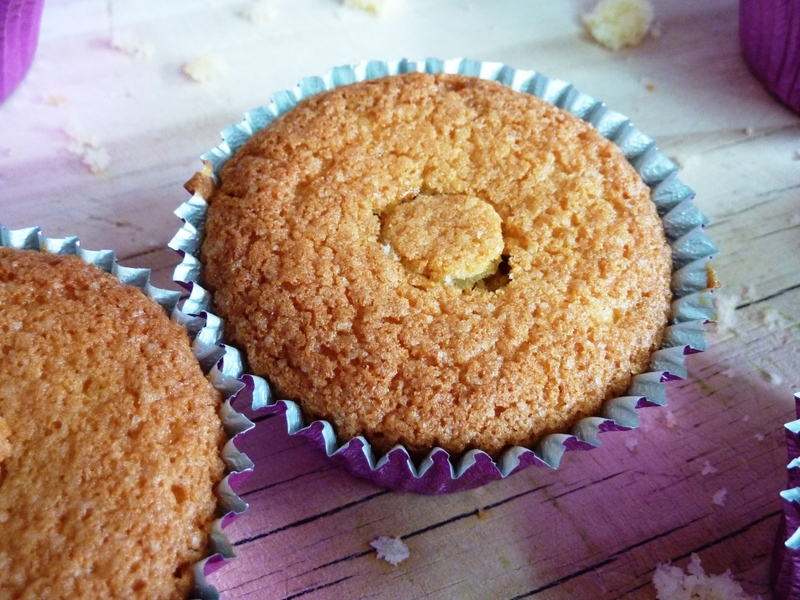 The best way to remove the tart from the tin is to ease the edges from the sides of the tin with a small knife, then place it on an upturned jar or tin, which will allow you to carefully ease the sides away. Next slide a palette knife or wide fish slice underneath and ease the tart on to a plate or board ready to serve, or simply cut it into portions straight from the tin base. This is the kind of recipe I am always drawn to. Not only for the promise of something tasty and nourishing, but for the ease at which it is obtained. I have made this recipe countless times already, it is a complete winner, and when free range chickens are on special this is something that gets made often. Given that Nosh has recently opened in Hamilton and free range chicken was among their opening specials, this got made twice in one week! For a low carb version I omit the rice, but my children love it with brown basmati and it is devoured readily by both children. 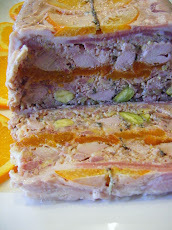 Don't forget the mustard to go with this, it really adds a level of flavour that makes it just that bit more delicious. which I imagine I will keep returning to as winter creeps in and my desire to cook increases! 1–2 sticks celery, sliced approx. Get out a large, flame-safe cooking pot (with a lid) in which the chicken can fit snugly: mine is about 28cm wide x 10cm deep. On a washable board, un-truss the chicken, put it breast-side down and press down until you hear the breastbone crack. (As you may imagine, I like this.) Then press down again, so that the chicken is flattened slightly. Now cut off the ankle joints below the drumstick (but keep them); I find kitchen scissors up to the task. Put the oil in the pan to heat, then brown the chicken for a few minutes breast-side down, and turn up the heat and turn over the chicken, tossing in the feet as you do so. Still over a vigorous heat add the wine or vermouth to the pan and let it bubble down a little before adding the leeks, carrots and celery. The chicken should be almost completely submerged by now and if not, do add some more cold water. You want it just about covered. Bring to a bubble, clamp on the lid, turn the heat to very low and leave to cook for 1½–2 hours. I tend to give it 1½ hours, or 1 hour 40 minutes, then leave it to stand with the heat off, but the lid still on, for the remaining 20–30 minutes. Serve the chicken and accompanying vegetables with brown basmati rice, adding a ladleful or two of liquid over each shallow bowl, as you go, and putting fresh dill and mustard on the table for the eaters to add as they wish. I have said it before....lemon or chocolate, hard to know which of these flavours (when combined with plenty of sugar) is my favourite. 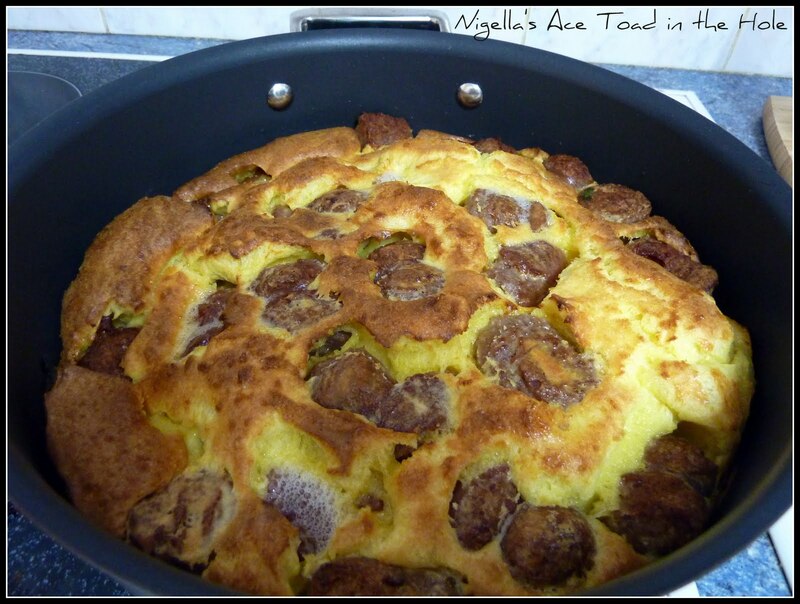 Certainly either seem to go down well at a morning tea and this recipe is no exception. This has to be one of the easiest slices to make and given how easy it is, I am surprised I don't make it more often. Again it is all done in the food processor and although the base needs cooking for a spell before the topping is added, it is a low effort recipe. 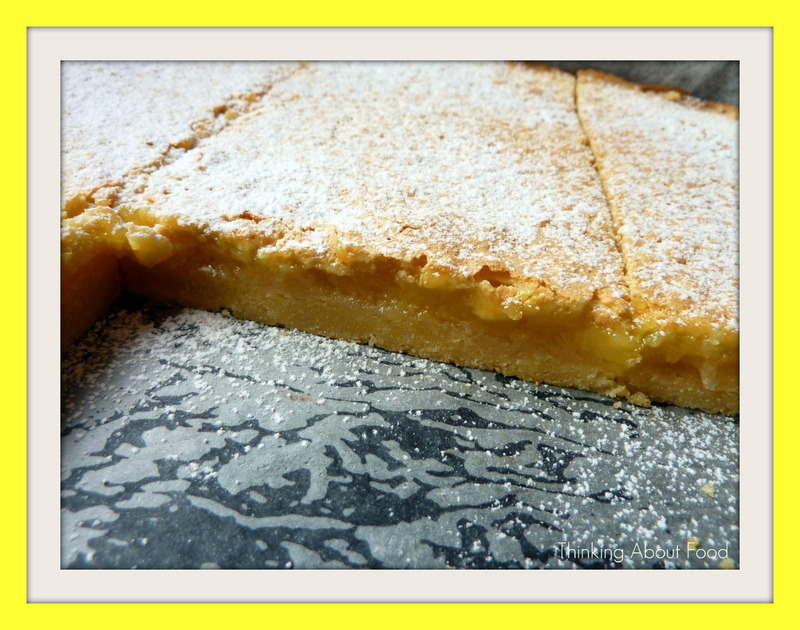 What I particularly love about this slice is how once baked you get an almost meringue-y top and a custardy lemon curd underneath. 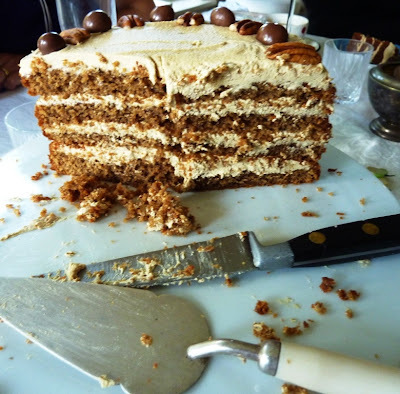 - all of those basic favourites like Louise cake, churchill squares, chocolate caramel slice, tan square and chocolate fudge slice are within its pages and it is therefore very well used. 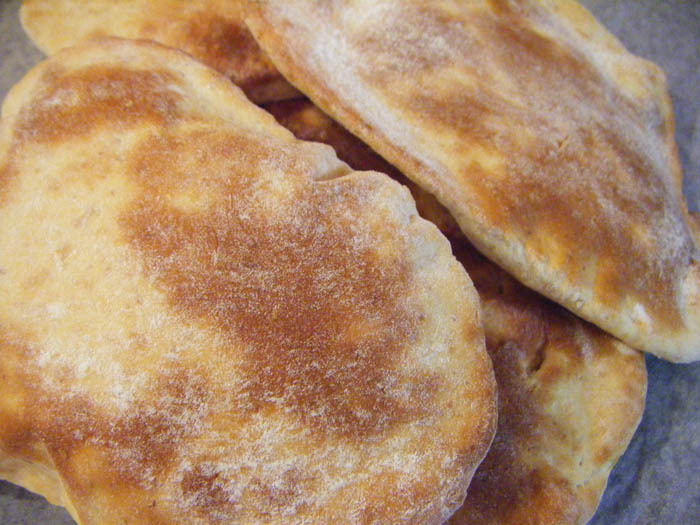 You will need a food processor for this recipe. Turn oven to 160C. Line a 23cm square tin with baking paper, ensuring the sides are covered and corners are sealed (fold the paper rather then cutting) so the liquid topping will not run off. Measure the flour, icing sugar and butter into the food processor and blend until the butter is finely blended through the dry ingredients. It will look quite dry and powdery, but don't fret. Tip the mixture into the tin and press down using the back of a fish slice or something similar. Put in the oven and bake for 15-20 mins, or until firm and straw-coloured. While the base is cooking...Without cleaning the blender add the sugar and lemon rind, blend until the rind is finely chopped through the sugar. Add the eggs, lemon juice and flour. Process until smooth. Pour onto the partly cooked base and put back into the oven for about 30mins. The top should be lightly browned and there should not be any wobble when the tray is jiggled. 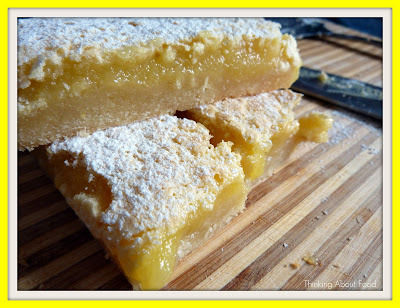 Once cooled slice into squares with a heavy, lightly oiled knife. 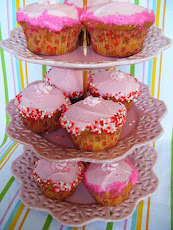 If you are serving to guests you could sprinkle with some icing sugar just before you put it on the plate. This cake comes from Nigella's latest book , it is one that I immediately bookmarked to make as it looked delicious. As it was being made for a girls get together I knew it was safe to make it and not have to worry about ending up eating the lions share of it! This is a ridiculously easy one to make, all the ingredients get thrown into the food processor, and it has walnuts in the actual cake to give it a yummy nutty taste and texture. The buttercream icing I made in my mixer instead of the food processor as Nigella suggests, because I think making it in the mixer gives it a much lighter fluffier consistency. Because I wanted a lighter buttercream I added a few tablespoons of milk to the recipe which makes it whip up nicely. 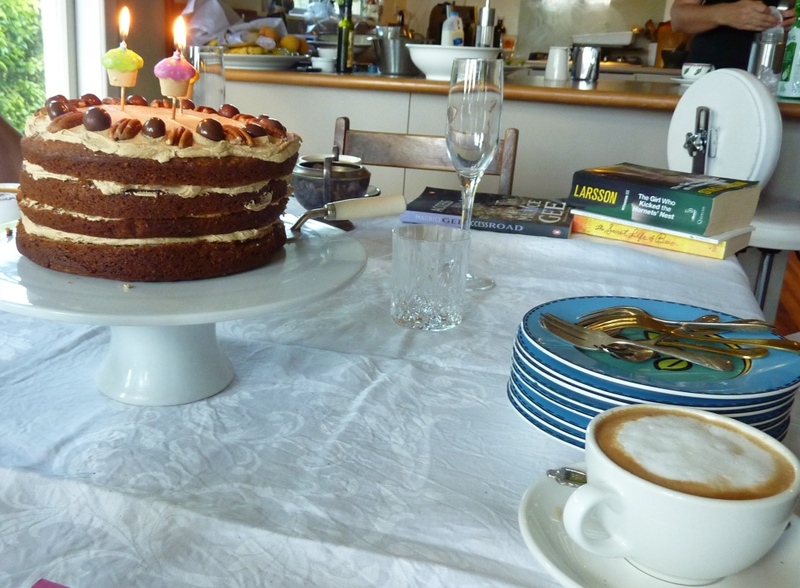 I also cut each cake in half to create a four layered cake, which worked well and there was plenty of buttercream to accommodate this change. Preheat the oven to 180 degrees Centigrade/gas mark 4. Butter 2 sandwich tins (20cm) and line the bases with baking paper. Put the walnut pieces and sugar into a food processor and blitz to a fine nutty powder. Add the 225g butter, flour, 4 teaspoons espresso powder, baking powder, bicarb and eggs and process to a smooth batter. Add the milk, pouring it down the funnel with the motor still running, or just pulsing, to loosen the cake mixture:it should be a soft dropping consistency, so add more milk if you need to (If you are making this by hand, bash the nuts to a rubbery powder with a rolling pin and mix with the dry ingredients; then cream the butter and sugar together, and beat in some dry ingredients and eggs alternately and, finally the milk). Divide the mixture between the cake tins, and bake in the oven for 25 minutes, or until the sponge has risen and feels springy to the touch. Cool the cakes in their tins on a wire rack for about 10 minutes, before turning them out onto the rack and peeling off the baking paper. 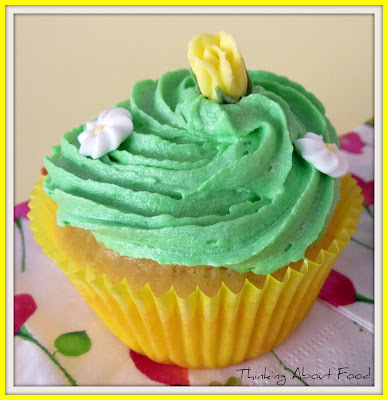 When the sponges are cool, you can make the buttercream, pulse the icing sugar in the food processor until it is lump free, then add the butter and process to make a smooth icing. Dissolve the instant espresso powder in 1 tablespoon boiling water and add it while still hot to the processor, pulsing to blend into the buttercream. Place 1 sponge upside down on your serving plate. Spread with about half the icing, then place it on the second sponge, right side up (ie so the 2 flat sides of the sponge meet in the middle) and cover the top with the remaining icing in a ramshackle swirly pattern. 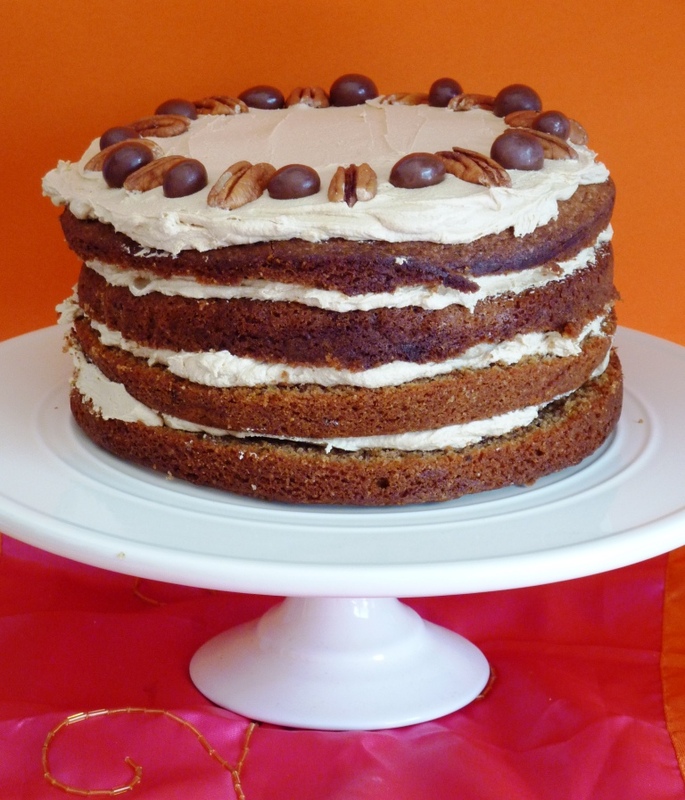 This cake is all about old-fashioned, rustic charm, so don't worry unduly: however the frosting goes on is fine. 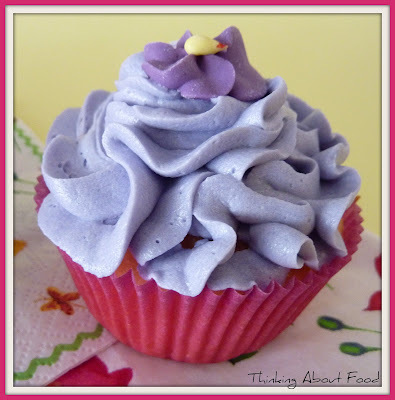 Similarly, don't fret about some buttercream oozing out around the middle: that's what makes it look so inviting. Gently press the walnut halves into the top of the icing all around the edge of the circle about 1cm apart. After a long break from posting I have decided to tackle the backlog of photos I have stored up over the last little while. My passion for cooking has been seriously curbed over the last 3 months or so, firstly due to the unbearably hot weather we have been experiencing and secondly due to the fact that my husband has been so ill and all my energy was being channelled into taking care of him. Sadly, he passed away last month, so in honour of him I am updating this, as one of our shared passions was FOOD! So much of my motivation to cook was driven by the fact that I had a captive audience in Glen, he really appreciated my efforts! And it meant that entertaining was frequent, another thing he really enjoyed. When Glen's appetite waned in the last few months it made it pretty hard for me, I always got so much joy from feeding him. He did however eat a hearty Christmas breakfast and dinner- he seemed to save it up for all the good food to be had on the day. This post is one I have wanted to blog for a while, I have expounded the virtues of using the breadmaker for making dough before and this is one of the reasons I LOVE my breadmaker. When you can turn out delicious brioche with next to no effort- well, that takes some beating! I make this in the breadmaker on the dough cycle then leave to prove overnight in the fridge, in a large bowl covered with cling film. I then knock it down, shape into rolls and leave to come to room temperature and rise slightly before cooking. 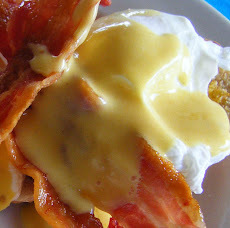 This is a great option if you are wanting to 'entertain' for breakfast or brunch. You don't have to get up obscenely early to get delicious hot brioche on the table to impress your guests! These are best eaten warm, with butter and jam (my preference is strawberry- homemade of course!). Remove baking pan and attach kneading blade. Place all ingredients in pan in the order listed. Insert baking pan, close lid. Program to dough setting and press start. 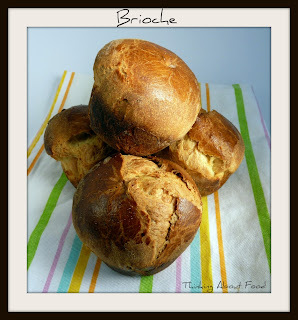 Shape dough into small balls and place into brioche tins (or muffin tins - which is what I use). 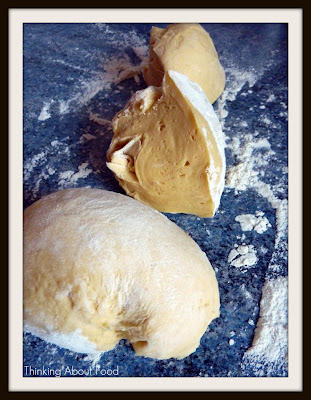 Make indentations in the middle of each roll and place a smaller ball of dough on top (I often omit this part, but it looks more authentic if you do it!). Leave in a warm place to rise for around 30 mins, brush with egg wash then bake at 180C for around 20 mins or until deep golden brown. This is the kind of recipe that is equally useful as a midweek family meal or for when entertaining. 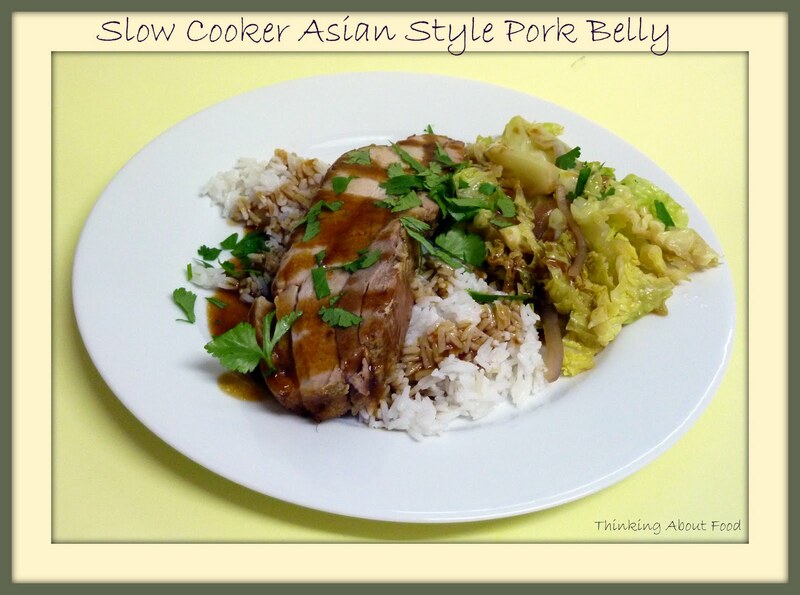 It can be done in advance and reheated to serve and is fabulously tasty. It does require a bit of effort as there are a few steps, but I love the idea of using lasagne sheets for cannelloni, it is both easier and tastes great. The bechamel sauce is one I now use regularly when making other dishes, infusing the flavours into the milk first is absolutely worth the effort for the extra dimensions in adds to the taste. 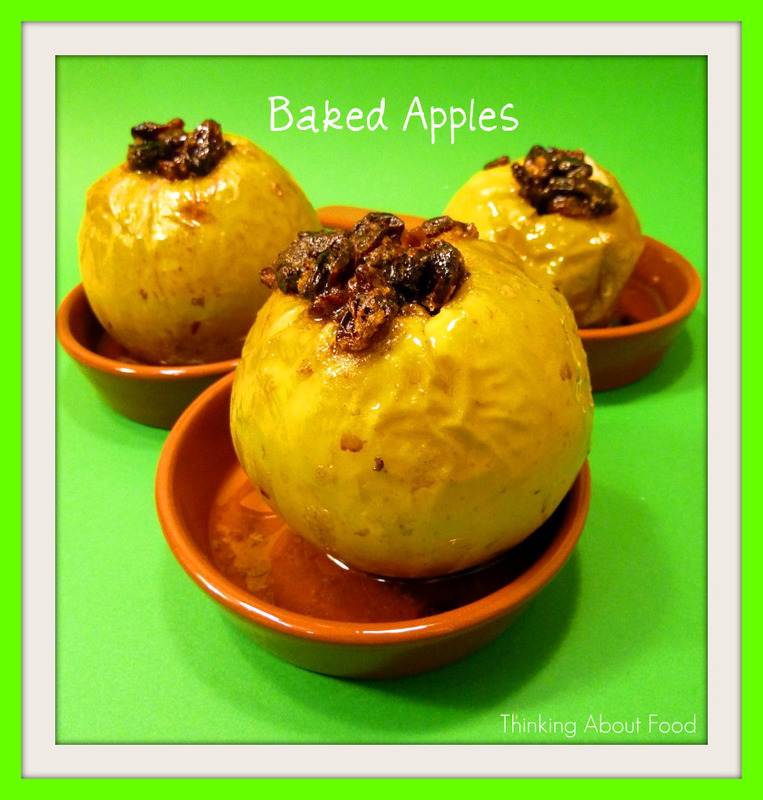 I can't recommend this recipe enough! It also freezes well! I added a tin of chopped tomatoes to the recipe, just to break the whiteness/creaminess. First make the filling by placing all the ingredients into the bowl of a food processor and blending everything on a low speed until thoroughly combined. If you don't have a processor, chop everything as finely as possible with a sharp knife and blend it with a fork. Wrap in clingfilm and chill for about 30 minutes to firm up. Next make the sauce by placing the milk, butter, flour, bay leaf, nutmeg and seasonings into a medium-sized saucepan over a medium heat, then, whisking all the time, slowly bring it up to simmering point until the sauce has thickened. Then turn the heat down to its lowest setting and let the sauce simmer for about 5 minutes, then remove the bay leaf, stir in the cream, taste to check the seasoning, cover and leave aside. 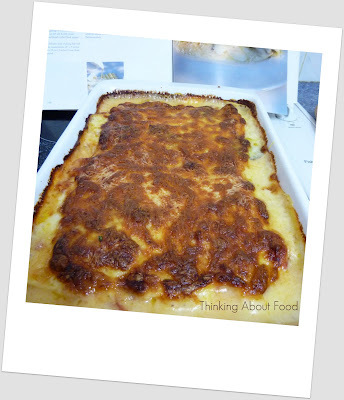 Now pre-heat the oven to gas mark 4, 350°F (180°C), then cut the lasagne sheets in half so that you have 16 pieces. Next divide the meat mixture in half and then each half into 8, then lightly roll each of these into a sausage shape about 3 inches (7.5 cm) long. Place each one on to a piece of lasagne and roll it up, starting from one of the shorter edges. As you do this, arrange them in the baking dish with the join underneath – what you should have is two rows neatly fitting together lengthways in the dish. Now pour the sauce over and scatter the Mozzarella cubes here and there. Finally, scatter the Parmesan over the top and place the dish on the centre shelf of the oven to bake for 40 minutes, by which time it should be golden brown and bubbling. Then remove it from the oven and let it settle for about 10 minutes before serving. Finally, sprinkle a little extra Parmesan over. It seems when baking I tend to go chocolate or lemon. It is difficult to determine which is my favourite! Maybe because I love good coffee, but also love freshly brewed tea that I hedge my bets and go with what suits! 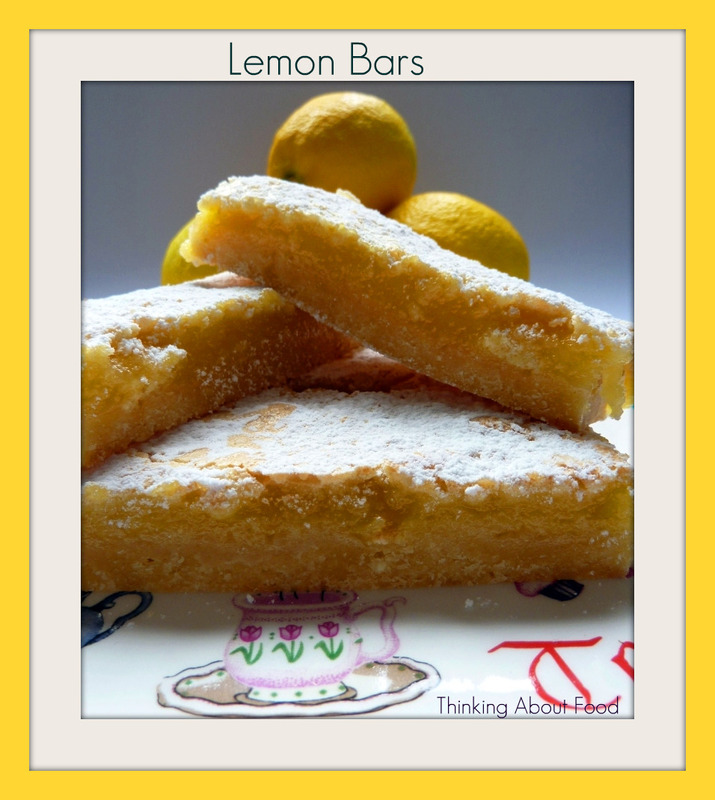 Lemon cakes and good tea are a gorgeous combination, but then coffee and chocolate- well, that takes some beating! What I love about this recipe is how ridiculously easy it is to make. 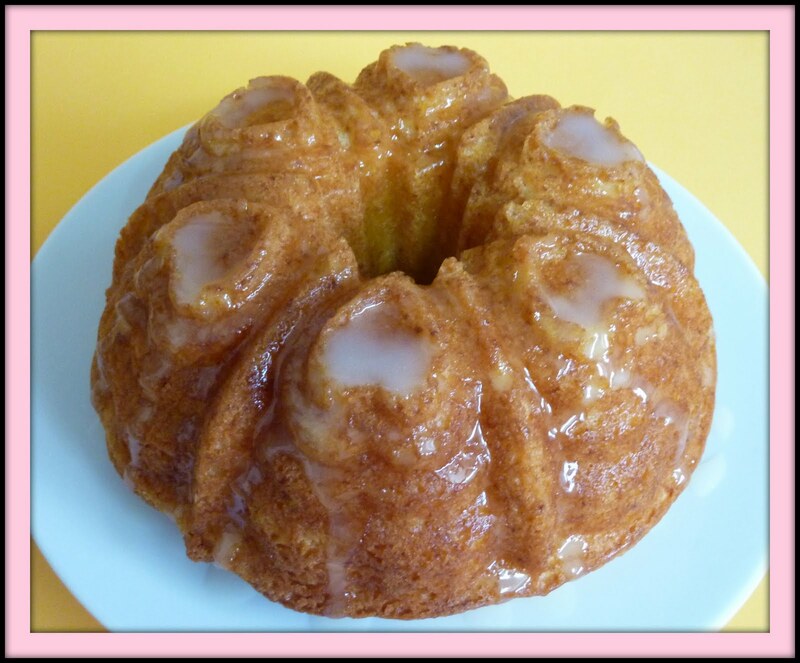 Because it uses oil it is a lovely moist cake that keeps well, and of course because there is no creaming the butter and sugar it is so quick to make. 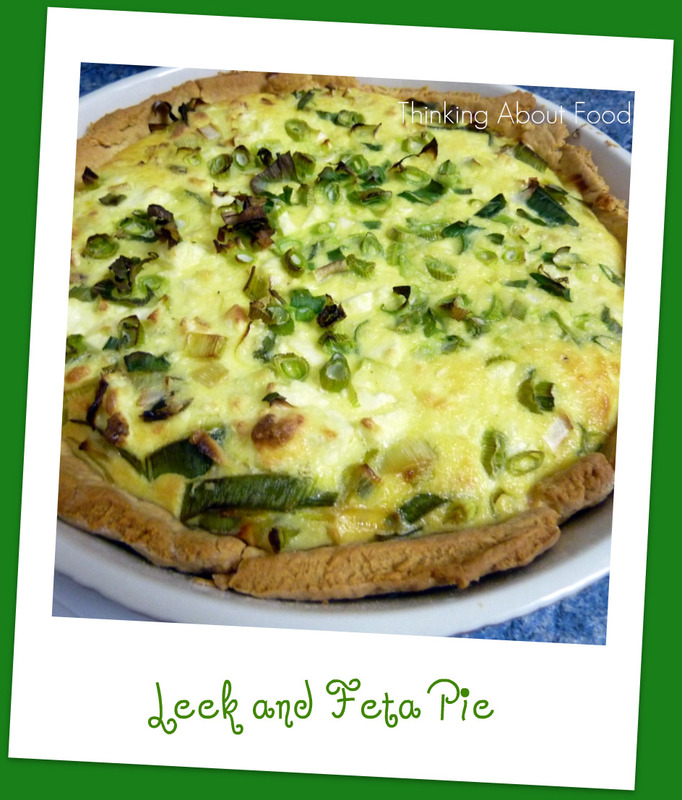 It is perfect for whipping up in a hurry, or for when you need to put something in the tins for lunchboxes but can't be bothered going to much effort. I used some of the cute tins I got from Lakeland (again transported home by my sister from the UK!). 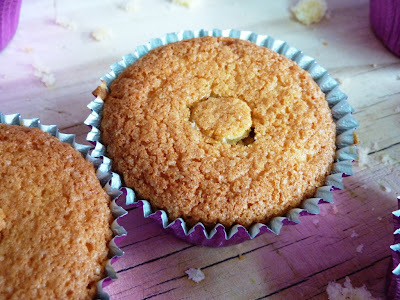 They worked beautifully, I sprayed them with baking spray and they fell out of the tin with ease. I topped the cakes with a simple lemon drizzle of lemon juice mixed into icing sugar, done to a nice pouring consitency. 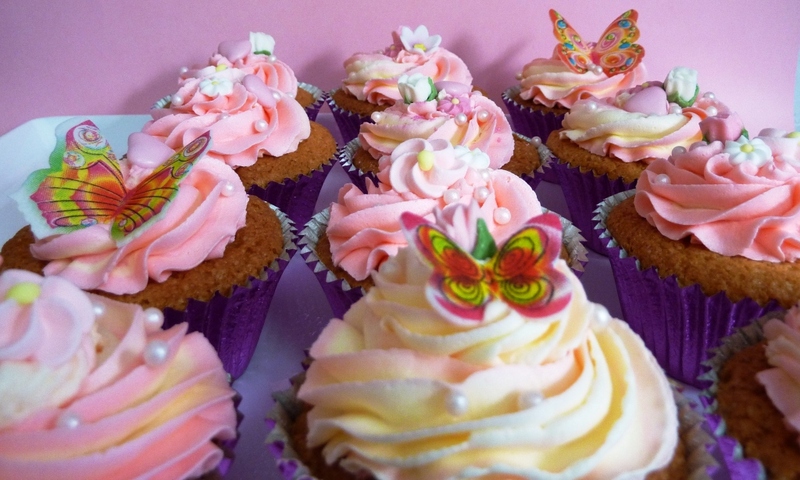 The perfect afternoon tea treat and lunchbox filler! Preheat the oven to 180° C (350° F), line the bottom of a round ten-inch (25cm) cake pan with parchment paper and grease the sides. In a large mixing-bowl, gently combine the yoghurt, milk eggs, sugar, vanilla, oil and lemon zest and juice. Add the flour into the yoghurt mixture, and blend together -- don't overwork the dough. Pour the batter into the prepared cake pan, and bake for 30 to 35 minutes, until the top is golden brown and a cake tester comes out clean. Let stand for ten minutes, run a knife around to loosen, and turn out on a rack to cool. and just knew I was going to have to try it. What I like about it is the idea of smaller bits of sausage, and the copious amounts of yorkshire pudding batter. To be fair, this almost had too much batter, and I think next time I might adjust the quantities a bit. I also found that there was enough fat in my sausages for cooking them and that the extra fat was too much. I suppose that depends on what sausages you use- I used some I had bought from our local farmers market, and they were utterly delicious, so next time I use these sausages for this recipe I won't add the extra fat! The other thing I loved about this recipe was the stove top to oven aspect of it. Starting on the hob then transfering to the oven made this such an easy meal to prepare, it is perfectly possible to do this mid week. The onion gravy was also great, I made it up while the toad was in the oven, simmered it down to give extra flavour. 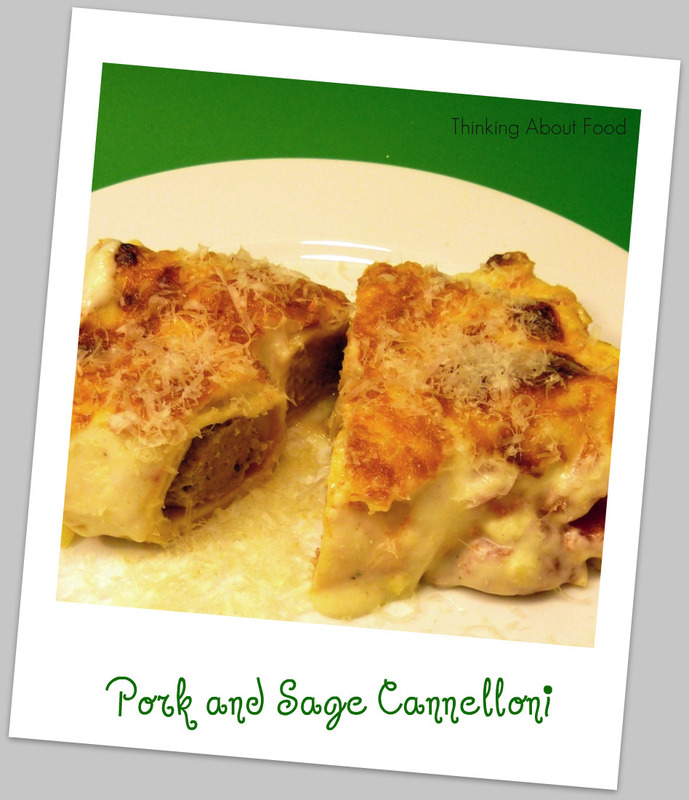 All in all, a delicious and easy meal which I will absolutely be making again! 1. Preheat the oven to 220C/gas mark 7. Whisk the milk and eggs together with the salt, then whisk in the flour, beating to make a smooth batter. I find this way round makes for a lighter batter. 2. Press the sausage meat out of its casing (you may need to nick the skin with a knife), half a sausage at a time, rolling it in your hands to form a ball and then squash gently to make a little, fat patty. You should get 12 patties from the 6 sausages. 3. Heat the fat or oil in a heavy-based, flame-safe roasting tin on the hob and brown the patties for about 1 minute each side: you need do no more than make them look enticingly brown. 4. With the patties and oil still hot, pour in the batter and quickly drop in the sprigs of thyme. Absolutely immediately put into the oven for about 40 minutes or until the edges of the batter have risen and turned golden, and the eggy middle has set. 5. 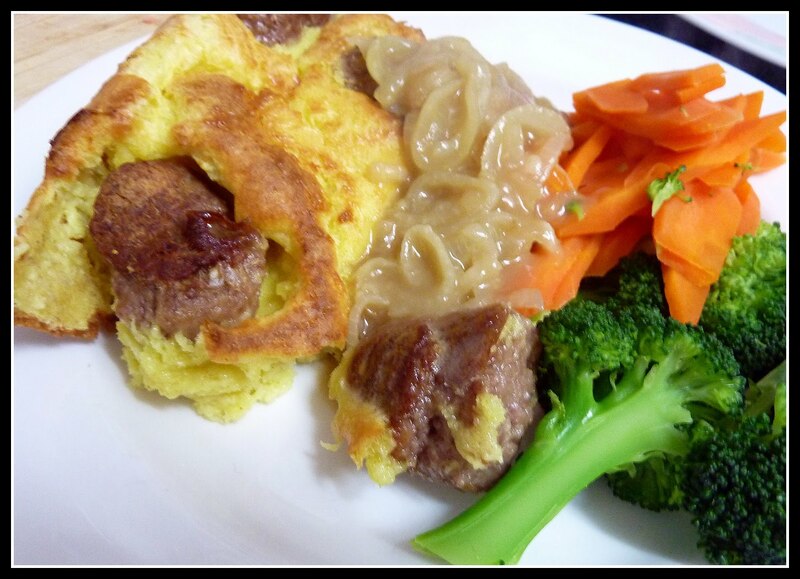 Serve immediately, scattered with a thyme sprig or two or just a few leaves and with gravy (for example, the onion one below) if you feel you can only properly enjoy Yorkshire pud when it’s sauce-sogged. The batter can be made a day ahead. Cover and refrigerate. The sausages can be formed into patties a day ahead. Cover and refrigerate until needed. Warm 2 tablespoons of fat or oil and then cook 2 onions, peeled, halved and very finely sliced, until soft (about 10 minutes). Add 2 teaspoons sugar, and let the onions cook, caramelising a little, for another 3 or so minutes, before stirring in 4 teaspoons flour then 500ml meat stock. When thickened and hot, add a glug of marsala to taste. My dear sister made space in her suitcase for a ridiculous amount of cake decorating paraphernalia when she recently visited the UK. I am a sucker for all things cupcake so took the opportunity to truly stock up on all manner of toppers, sugar flowers, sprinkles and cachous. The range and price certainly made it worthwhile, moreso because my sister was able to cut out the freight!!! I have had such fun making bits and pieces, here are a few of my latest creations. I am also completely in love with the Hummingbird Bakery recipe for buttercream frosting. It whips up beautifully and makes decorating so pleasurable. In case you want it, here is the recipe again!!!! 1. 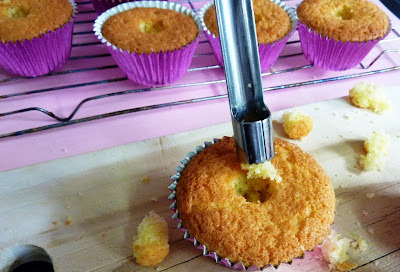 Beat the icing sugar and butter together in a freestanding electric mixer with a paddle attachment (or use a handheld electric whisk) on medium-slow speed until the mixture comes together and is well mixed. 2. Turn the mixer down to slow speed. Combine the milk and vanilla extract in a separate bowl, then add to the butter mixture a couple of tablespoons at a time. Once all the milk has been incorporated, turn the mixer up to high speed. 3. Continue beating until the frosting is light and fluffy, at least 5 minutes. The longer the frosting is beaten, the fluffier and lighter it becomes. 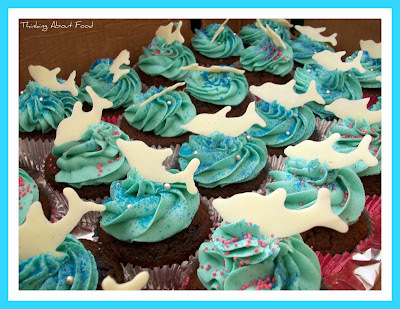 I also recently made these cupcakes - I piped white chocolate dolphin shapes onto baking paper and then used them for toppers!